Steve Simmons' book is a well organized exploration of large format photography, starting from basic principles, then walking the reader through each step in the selection and use of equipment and materials. He notes that the modern view camera is essentially the first camera type that was developed, then explains how it has been improved so that it is the instrument of choice for top quality images. About the first half of the book is hardware-oriented. He explores older and newer cameras and lenses and provides advice about each. 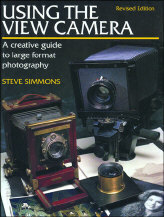 While all formats are discussed, this is basically a book about 4x5 photography. Over 20 pages of this 144 page book discuss the optical principles and the capabilities that make view cameras unique--the movements of film plane and lens plane. The quality and content of the accompanying images shows the compositional problems and strategies that view cameras are designed to accommodate. You might want to photocopy these pages to take into the field as you explore the capabilities of your new view camera. These sections are very well designed for photographers with experience with small formats who want and need to understand how large format photography is different. The last third of the book explains how Simmons and "guest" photographers approached shooting a broad range of fine examples of both commercial and fine arts images. 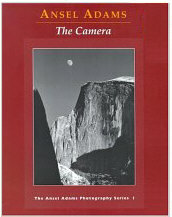 The Camera is the first of three volumes that Ansel Adams wrote describing his approach to photography. The other two volumes are The Negative and The Print. A fourth volume, Examples: The Making of 40 Photographs, includes Adams' comments about and analysis of 40 of his best images. This series explores all formats and since Adams' most productive period coincided with large format equipment as the primary choice for high quality images, large format gets generous treatment. Chapters that I found especially helpful were those which discussed Adams' idea of visualization--knowing what image you want to shoot before you begin shooting it; Chapter 7, "Basic Image Management"; and Chapter 10, "View Camera Adjustments". 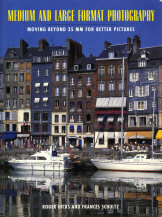 The subtitle of this volume by Roger Hicks and Frances Schultz--"Moving Beyond 35mm for Better Pictures"--gives you the best idea of the focus of this book. All of the books described on this page have images of equipment to illustrate camera types and techniques discussed, but equipment description and illustration is the forte of the Hicks/Schultz book. Equipment described is representative, but weighted toward their preferences, and those are clearly stated. As they move through the various formats, they present some history, tell you older equipment to exploit or avoid and give you their opinions on tradeoffs in using each format, usually illustrated by personal images that they believe make the case for their choices. For the most part, these images are not masterpieces, but often interesting in their own right as well as serving as examples. This is an excellent title for the photographer who is becoming interested in medium and large format and wants to see the format and equipment options, particularly information about older equipment, for which information is sometimes scarce. 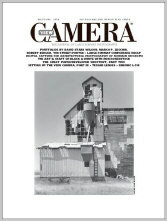 View Camera magazine is one of those journals that you read cover-to-cover, including the ads which are well chosen to appeal to those interested in the content of the journal (for example, the only kind of "enlargement" advertised is photographic). This isn't about your father's dusty old wooden 4x5, though you might find an article celebrating its make and restoration. Many of the photographers and much of the equipment featured is film-based, but there are also articles about new digital equipment with the optical and compositional capabilities of traditional large format equipment and descriptions of LF photographers who are exploring digital printing at the cutting edge. Art is balanced with technique. While there is a regular group of contributors, most issues contain articles by specialists in the critical or technical content of the articles. The publisher, Steve Simmons, also maintains a Web site with supplemental content that is universally accessible and some of which requires an access key included on your mailing label. There is also an international electronic edition based around PDF files for downloading. In the print edition, printing and paper are of the highest quality befitting the images that are published. Issued six times a year.